Whisk egg whites in small bowl until foamy. 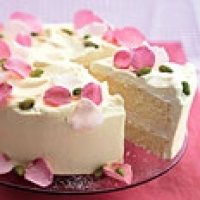 Using a pastry brush, brush rose petals on both sides with egg whites; sprinkle on both sides with sugar. Butter two 8-inch-diameter cake pans with 1 1/2-inch-high sides. Line pan bottoms with parchment paper; butter parchment. Sift flour, 7 Tbsp baker's sugar, baking powder, and salt into large bowl. Whisk yolks, water, oil, lemon peel and cardamom in small bowl until smooth. Beat egg whites in medium bowl until soft peaks form. Gradually add 7 Tbsp baker's sugar; beat until whites resemble thick marshmallow fluff. Bake until cakes are golden and toothpick inserted into center comes out clean, about 25 minutes. Cool in pans on racks 15 minutes. Combine 1/2 cup cream and saffron in small saucepan. Remove from heat; let steep 20 minutes. Beat remaining 2 cups cream, powdered sugar, and rose water in large bowl until soft peaks form; blend in saffron cream. Spread 1 cup frosting over. Adapted from Bon Appetit, June 2005.
does anyone know where I can buy this cake from? any bakery??? Sounds elegant,luscious,decadent and utterly complicated lol, the photo is breathtaking! oh you certainly have my 5.
great post! thanks I've been looking for those rose petals! This is good. I bought rose water for Turkish Delight, and needed something else to use it in. Thanks!